This is a challenging Mystery Glimpse. Here’s a page from the register of an inn. Who is the Very Special Guest? 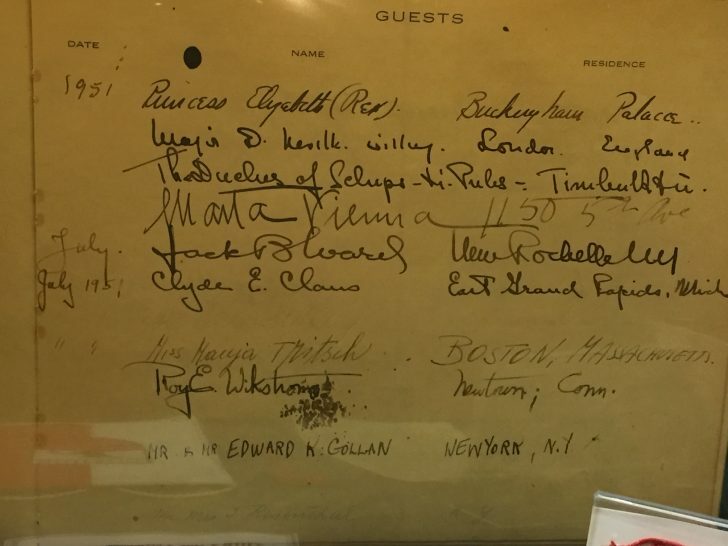 Can you name the inn this guest stayed in back in 1951? Hint: New Hampshire. 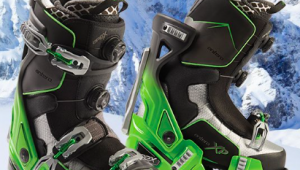 Hint 2: Think of Tyrolean-themed chalets. Hint 3: It’s all because of the Baron. Yes, these are the Bradley Bashers, Bombers, or Packer Graders, and, yes, you had to be a fantastically brave skier to tow one of these down the slopes. 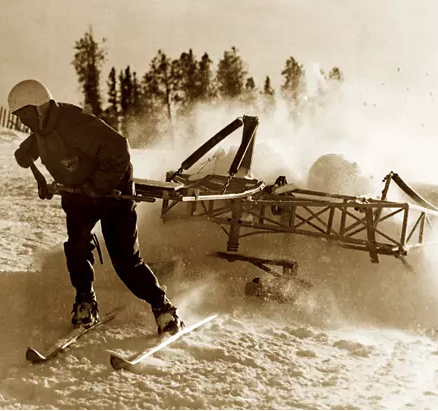 The inventor was Steve Bradley of Winter Park, CO, often called the Father of Snowgrooming. He invented this gravity-run implement in 1952, and it became quite popular in the mid-50s. 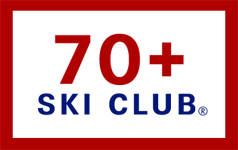 We remember going to a National Ski Area Association meeting in 1970 or so where these devices were demonstrated. We still remember thinking, “What happens if…. ?” but the thought was too scary. Thankfully, the field of snow grooming has moved on to safer equipment. Bradley as an innovator in many ways. He experimented with solar power, re-thought cafeteria lines, and managed Winter Park’s emergence as a nationally known center for disabled sports, among many other honors. You can read more about his achievements here. 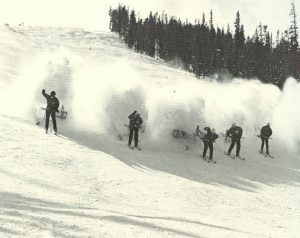 Thanks to the Colorado Snowsports Museum for providing this wonderful picture. The whole idea was to bust up moguls and smooth out crud. Gravity was both a friend and an adversary. The village was Mittersill on the side of Cannon. Princess Elizabeth at Mittersill two years before she changed her title to Queen.